The 1920 W516-1 baseball card set consists of 30 cards that measure 1½" by 2-3/8". The W516 baseball cards strip cards were sold in long strips and then cut out by the store owner or consumer. The W516 set is broken up into three subsets. The first subset has handwritten letters and a normal image. The second subset has a typed name and position and a reversed image. The third subset is handwritten but has a reversed image. 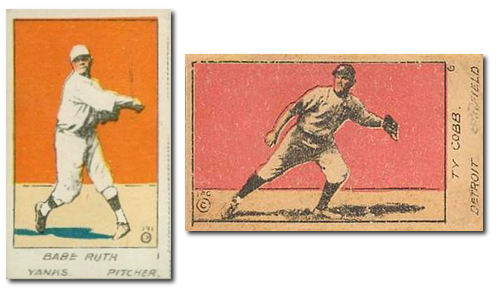 1920 W516 cards have colorful painted fronts with either a portrait or action shot of the players. Name, team name, and position are listed below the border, with card number to the right. The card backs are blank. Hall-of-Famers included in this issue are: #1 Babe Ruth, #4 Ray Schalk, #5 Tris Speaker, #6 Ty Cobb, #7 Rogers Hornsby, #8 Walter Johnson, #9 Grover Alexander, #23 Eddie Collins, #24 Christy Mathewson, #27 Harry Hooper and #30 Dave Bancroft. CLICK HERE if you want to sell your 1920 W516-1 Baseball Cards.